Georgian Foreign Minister Mikheil Janelidze held a meeting with Council of Europe Secretary General Thorbjørn Jagland, who arrived for an official visit in Georgia. The sides discussed the issues relating to co-operation between Georgia and the Council of Europe. 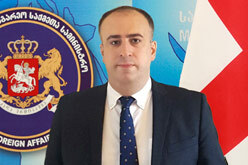 Mikheil Janelidze provided the Secretary General with detailed information regarding the difficult security and human rights situation in Georgia’s occupied territories. Special attention was paid to the importance of human rights monitoring in Georgia’s occupied regions. Thorbjørn Jagland reaffirmed the Council of Europe’s unchallenged support for Georgia’s sovereignty and territorial integrity. He also reaffirmed that Georgia will remain on the CoE agenda and pledged that the practice of submitting the Secretary General’s consolidated reports on the conflict in Georgia will continue in the future. The sides also discussed the Council of Europe’s Action Plan on Georgia for 2016-2019, which envisages strengthening the rule of law, ensuring the protection of human rights and effectively implementing confidence-building measures between the war-torn communities. Talking points also included the ongoing and already implemented democratic reforms in Georgia and the parliamentary elections held in 2016 which were positively appraised by the Secretary General. Following the meeting at the Georgian Foreign Ministry, Thorbjørn Jagland paid tribute to the memory of those who died for the unity of Georgia and laid a wreath at the Fallen Heroes Memorial. Within the framework of his visit to Georgia, the Council of Europe Secretary General will hold meetings with the President of Georgia, Prime Minister and representatives of the executive and legislative branches of the government.